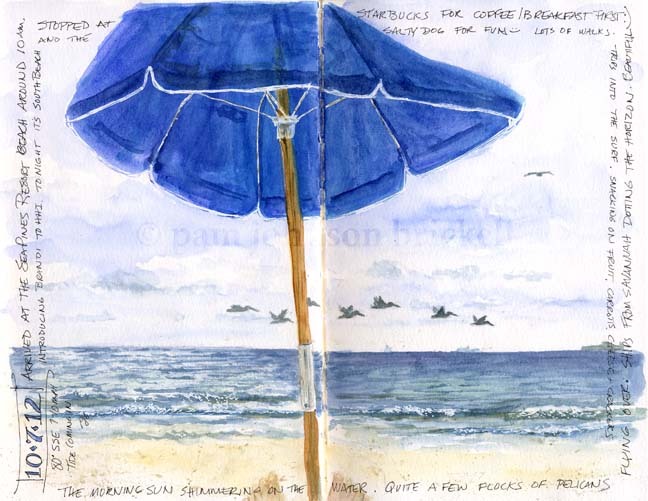 South Carolina LowCountry Nature Journaling and Art: Beaching It.... Again! I don't mean to flaunt :) Actually for someone who only lives 15 miles from the beach, this is only the fourth time we've been this year! Very sad, really! 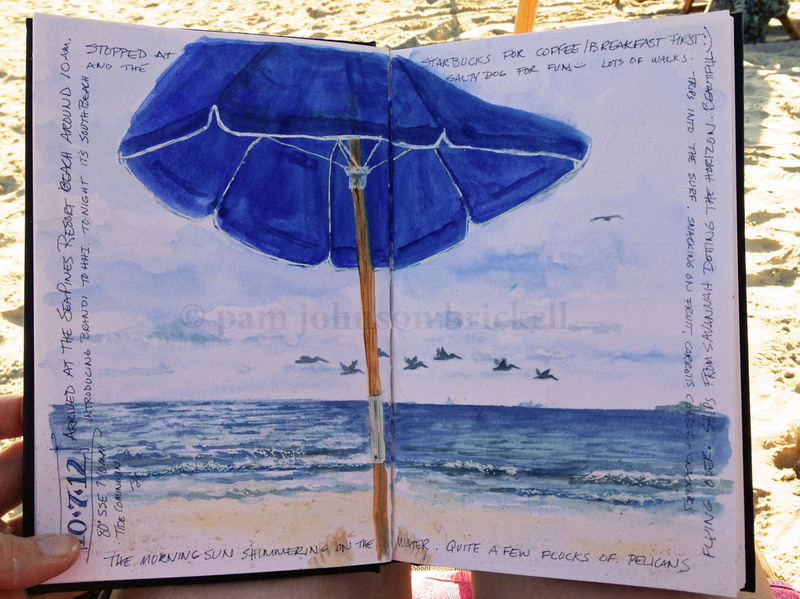 This spread is the second in my new Stillman & Birn hardbound, Beta Series journal. I've officially decided to designate it for all things water related. This morning, upon waking, I was composing the title page in my mind. I will take my time to create it. I want this page to be just right, no pressure to create, and I want it to just ooze with the love I feel when around water; be it marsh, stream, river, lake or ocean and all the flora and fauna that lives in these environs. Painting at the beach has its challenges. My skin doesn't handle a lot of sun exposure well, so when not walking the shoreline, I'm hugging the shade under the umbrella. I'll just get deep into painting and the sun will have moved enough so the chairs need to relocated. Then, working on you lap can be awkward... the threat of sand in your paint and on your brush, surrounds you! I really like the quality of paper this journal offers. 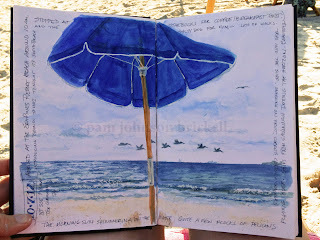 I was able to lift the blue of the water to make room for the umbrella's pole without damaging the surface. It handles layering of colors well and is smooth enough to use a Micron 01 pen. I used pan watercolors and a waterbrush. My next adventure will be to use traditional watercolor brushes and see how the paper holds up to more water. I've not painted pleir air with anything but a waterbrush so this will be fun! !